﻿The College of Geosciences is pleased to announce six new Chairs and Professorship holders. Endowed Chairs and Professorships are among the the most prestigious distinctions that a faculty member can receive from an institution of higher learning. The College of Geosciences is fortunate to have many committed benefactors who are passionate about the teaching, research, and service of exemplary faculty. Their generosity makes it possible for the faculty at Texas A&M to be the leaders in world-class geosciences. Dr. Dessler’s research focuses on climate change and water vapor, climate change policy, and atmospheric chemistry. The goal of his work is to improve the understanding of the physics of the atmosphere, and provide measurements to better test the validity and accuracy of global climate models. He has served as a Senior Policy Analyst in the White House Office of Science and Technology Policy, and wrote a book on climate change politics based on his experiences. The Earl F. Cook Professorship in Geosciences was established in 1983 by the Ray C. Fish Foundation through the Endowed Faculty Scholars matching program. It honors former Dean of the College of Geosciences (1971-1981) and Distinguished Professor of Geology and Geography Earl F. Cook. Dr. Duan's current research interests focus on earthquake source physics, particularly earthquake rupture dynamics on geometrically complex fault systems within complex geologic structures – along with physics-based strong ground motion prediction and seismic hazard analysis. The Francesco Paolo di Gangi/Heep Endowed Professorship in Theoretical Geophysics was established in 2003 by the Heep Trust. It honors retired Geology & Geophysics Professor Emeritus Anthony F. Gangi. Dr. Everett’s research interests include: Near-surface applied geophysics, environmental site characterization, geomagnetic induction and mantle structure, ground penetrating radar, magnetics, marine electromagnetics, hydrogeophysics, and engineering geophysics. This Professorship was established in 2007 by Howard Karren, a ‘51 Texas A&M graduate with a degree in Geology. Mr. Karren held multiple executive positions with several oil companies. Over the course of his 50-year career, Mr. Karren traveled to over 120 countries on 6 continents and negotiated oil development rights and partnership agreements in every major oil and gas producing region in the world. Dr. Klein's current research interests lie in the application of remote sensing and geographic information science (GIS) techniques to study the cryosphere. He and his students are currently using remote sensing to monitor tropical glacier recession. Dr. Klein has also been actively involved in the development of algorithms to measure snow extent and snow albedo from data collected by NASA's MODIS instrument. The EOG Teaching Professorship in Geosciences was established by EOG in 1994 as a teaching Professorship. 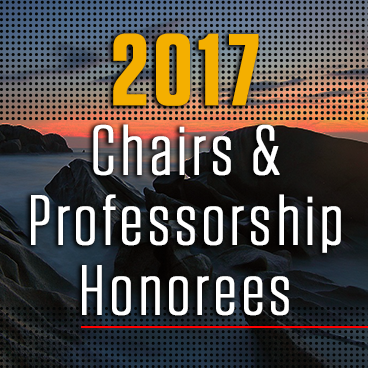 It is awarded to an associate or full professor who excels in mentoring students in the classroom, lab, and through advising. Dr. Marcantonio focuses on how isotope and trace element tracers can be used to understand the relationship between past climate change and past oceanic biological productivity, along with deep-ocean circulation. Established in 2001, this Chair was given by Jane and Ken Williams. Ken Williams graduated from Texas A&M with a degree in mechanical engineering in 1947. He is the 2007 recipient of the Michel T. Halbouty Geosciences Medal. Williams has been a generous supporter of the College and a major figure in the oil and gas industry throughout his career. Dr. Zhan’s research interests include: groundwater hydrology, flow and transport in geological formations, stream-aquifer interaction with connected and disconnected rivers, vapor flow and transport in the subsurface, and coupled unsaturated-saturated flow process. Established in 1983 by the Ray C. Fish Foundation, this Professorship honors the late Ray C. Fish. Mr. Fish was the founder of the Fish Engineering Corporation in Houston, TX, overseeing engineering and construction of intercontinental gas pipeline systems, including projects such as the Transcontinental Gas Pipeline System (Transco), the Pacific Northwest Pipeline System, and the Campo-Duran Project in Argentina.